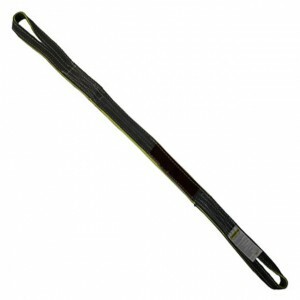 Nylon reverse eye slings offer heavy duty strength, flexibility and durability. This lifting sling features reverse eyes on both ends of the strap with eye widths equal to half of the body with. The eye loops are sewn open at 90°, or perpendicular, to the sling body. Both eyes and sling body are reinforced with texturized nylon wear pads which are more resistant to abrasion than standard webbing. Sling life can be extended by reversing the eyes and exposing the other side of the sling to wear. Reverse eye slings will work in all three hitches but are more advantageous in a choker or basket hitch. Made in the USA, CORE™ Nylon Reverse Eye Slings are trusted for their quality and safety features. Our nylon slings feature a durable heat-imprinted tag and meet or exceed all present OSHA and ASME B30.9 standards. Nylon Reverse Eye slings are available from CORE™ Industrial Lifting Slings in several different widths, lengths and rating capacities. If you need assistance in determining what lifting sling will work best for your application call our lifting sling specialists at 888-794-0587 Monday - Friday, 7am-5pm CDT and let us help solve your lifting problem. CORE™ Industrial Lifting Slings also offers a Reversed Eye Flat – Type 7 sling where the body is turned 180° forming an eye that is in the same position as the sling body. 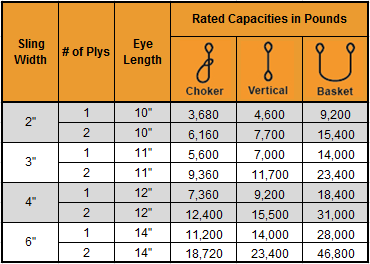 If standard webbing is acceptable for your lifting application check out our Nylon Twisted Eye and Eye Slings. Do not exceed work load limits. Sling failure can cause death or injury. Failure may result from sling damage, misuse and excessive wear. Inspect before use. Follow industry standards & regulations. © 2019 coreslings.com. All Rights Reserved.